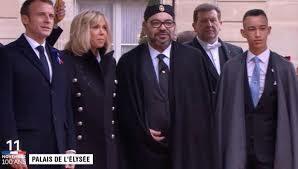 King Mohammed VI, accompanied by Crown Prince Moulay El Hassan, was at the front row of the world leaders who attended the ceremony held Sunday in Paris to mark the centenary of the Armistice that ended World War I. The King and the heir apparent sat next to US President Donald Trump & the First Lady Melania, German Chancellor Angela Merkel, French President Emmanuel Macron & his wife Brigitte and President Vladimir Putin of Russia. According to some analysts, this eloquent image shows Morocco’s status on international scene as one of the major global peace-makers and contributors, playing a key role for the world stability. The participation of the Moroccan Sovereign in this historical event reflects the strong friendship ties existing Morocco and France. It pays tribute to the thousands of fallen Moroccan soldiers who fought for freedom and peace during World War I. It also sends a strong message to the international community that Morocco is deeply committed to world peace & stability, multilateralism and universal values of democracy, freedom and equality. The commemoration of Armistice Day honors and pays respect to all the fallen soldiers who participated in this bloody war regardless of their country of origin, color, or faith for the triumph of these universal ideals. The event features speeches, concerts, parades, a luncheon for world leaders and the opening of the Paris Peace Forum, a global gathering of leaders and civil society dedicated to international cooperation and multilateralism. Organized by the French Ministry of Foreign Affairs and several think tanks, the three-day forum will look into several issues related to international cooperation and world peace. Posted by Hafid El Fassy on November 11, 2018. Filed under Columns, News, Zoom. You can follow any responses to this entry through the RSS 2.0. Both comments and pings are currently closed.